For a few freebies related to diaper and sleep tracking, read on! Whether it's your first baby or your fourth, at some point you may want to track the number and frequency of diapers that you've been changing. Or perhaps keep a sleep log, as many books on sleep recommend, such as The No-Cry Sleep Solution: Gentle Ways to Help Your Baby Sleep Through the Night. Tracking activities helps you understand your baby's needs better by determining typical times for when baby is asleep, how long he slept, when baby is awake and how long, how many diapers a day, how often is baby nursing and the duration... you get the picture. Knowing these things can help you with scheduling your day around baby's sleep and nursing times, the best time to make appointments out with or without baby, or answer questions from the doctor about baby's nursing habits to determine how well baby is doing. I went through all this with my baby, too. Here's what I used, maybe it'll be of use to you as well. First, the best thing about this online software is that it is FREE for tracking diapers. Second best thing is that you can use ALL its features for free for 14-days. Third best thing is that you can use it on your iPhone! Trixie Tracker is an online tracking tool for keeping track of sleep, diapers, breast feeding, bottle feeding, pumping, solids, and medicine doses. When my baby was one-month old, I used this for 14-days, which is the free-trial offer. I kept track of sleep, diapers, and breast feeding. Once you build up the data in the software you can see a visual of the trends in your baby's activities, so that was cool. However, I did opt to discontinue using the tracker at all after the free trial, as it did take a bit of time to enter all the information. For a comprehensive review of this software, check out hippie dippie bébé's blog review. To sign up to Trixie Tracker, click here. Even if you decide not to continue the trial, the diaper tracking part is totally free. I eventually wanted to track my baby's sleep habits again. I just wanted something super simple. So I made my own using an Excel spreadsheet. Over time I decided I wanted to also track diapers, feeding, and baths, so I added those to the spreadsheet. You are welcome to download and use this spreadsheet***. I kept it as simple as I possibly could as I was only looking to track trends in sleep, nursing, and keep tabs on last feeds, diapers and baths (as you know, for new moms the days and hours all mesh together after a while). ***Note that when you open the file you will get a message about the document containing macros. Please choose Enable Macros. If you don't, the things I've set up in the document will not work properly. If the Toolbar isn't displaying, you must right-click on the top of the Excel program toolbar area and you will get a drop-down menu. On the list should be "Baby's Daily Log", select that and the special toolbar should appear. See screenshot to the left. I hope you find this handy - let me know if you like it, if there are errors, if it could be improved. If you have any questions about the document, please leave me a comment on this post. Following are a few more free logs (I did not use any of these myself). Check them out to see which style works best for you! I only recently came upon this breastfeeding log on hippie dippie bébé's blog, so I've not used it myself but it looks very useful and convenient. It is a PDF you can print out and take with you to the hospital / take home with you. To track your feeding you just circle the time - very quick and simple. The log includes tracking of wet or soiled diapers. A super handy part of this log is that it provides a description of what the soiled diapers should be like each week, and what the typical amount of soiled or wet diapers should be. This is great, especially for new moms who would not be familiar with "what is typical" for baby during these early weeks. 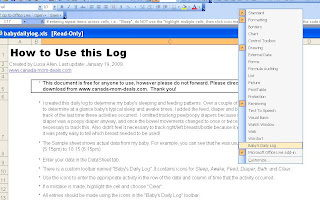 If you want to log more detail regarding your nursing, there is an Infant Feeding Log available on Microsoft.com's free template site. You can track the length of feeds, amount of feeds (if bottle feeding), wet diapers, and BMs (bowel movements). You write in the exact times of these activities. This is a pretty log that you just put a check mark each time baby has a wet or poopy diaper. You can fill in exact times for nursing, amount and duration; there's a spot for notes too. Grab this download from Parents.com - note that you will need to sign up to their site to get access to the file. 12 Response to "Diaper and Sleep Tracking Tools"
I downloaded your sleep log a few days ago. It works great for me, just what I was looking for! thanks! This is the app we use on our iPhone. grifdad: Thanks for adding that info! I checked it out, looks cool! It's just a simple one for basic activities. Spreadsheet looks great, only thing is that I can't seem to find the custom toolbar. This is clean and simple, I plan on using it on my iphone also. Glad to hear that the spreadsheet is working for you! If the toolbar doesn't automatically appear you need to enable it. To do that, right-click on the main Excel toolbar, which should then display all the menus available to you. You should see "Baby's Daily Log" and the bottom of the menu. Let me know if that works or not! I can't get the baby toolbar to show. Help! I really would like to use this. I am running Office 2003. Hi Heather, see my response to John (the comment post before yours), the instructions are there. I used Excel 2003 to create the spreadsheet so it should work. Hi Lucia, thanks for the comment. I did try this, but after right-clicking I did not see the "baby's daily log" toolbar. Hmm....wish I could figure it out! :) I enabled Macros and everything. PS I can send you a screenshot of what I see when I open the spreadsheet if you have an email address - maybe that'd be the easiest way to see if I'm missing the obvious! Hi Heather! Sorry you are having such trouble. I've added a screenshot to the original posting, let me know if that helps! Thanks so much. You are awesome for creating this. Unfortunately I still don't get the special toolbar. I get all the other menus, but not the baby's daily. My email address is hlhalstead@gmail.com, if you have it as an emailable file I'd really appreciate it...maybe that'd work....but beyond that, I guess I'll have to give up! It's such an awesome tool - good for you for creating it! Wish I was smart enough to create it for myself :).